I arrived on Thursday evening and made my way north to Julie & Scot Herrmann’s home for the weekend. The Herrmann’s are some of THE nicest people in cyclocross and they do so much for the sport in their area, in addition to being The Voices of American Cyclocross. (Un)fortunately for me, the rain decided to follow me up from Texas, and made it’s debut just as the course preview window opened on Friday. I don’t necessarily mind riding in the rain or the wet, but I do dread the clean up and as I get to the hour mark of cleaning bikes and wheels in the dark, I start to wonder why I chose to pursue such an equipment-intense sport… Love. That’s why. Course pre-ridden, bikes cleaned, and belly full, I closed my eyes on Friday night ready for the weekend of racing ahead. The weather had not improved on Saturday morning. Rain clouds drifted across the Cincinnati area throughout the day ensuring the course would be as slippery as possible for each category of racing. I took my time getting on course, on account of the aforementioned clean up, but eventually went out for a few laps to dial in my lines. The course itself was relatively flat over the full length of the track but the number of off-cambers required you to be at attention for the whole lap. Add in the moisture of the top soil over the hard clay underneath and the real test would be who could stay on their bike the longest. The best riders in the country rocked up for this one, as they do every year! 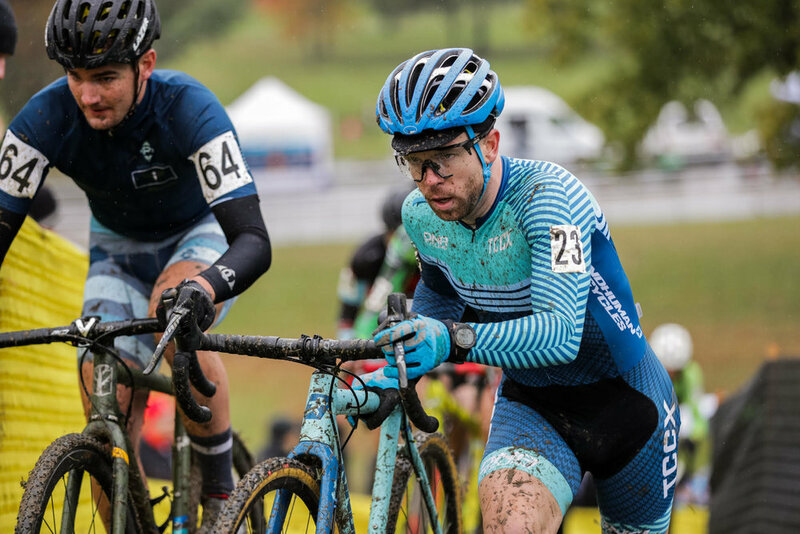 As I looked over the options for racing this season, Cincy CX stood out to me for that very reason. 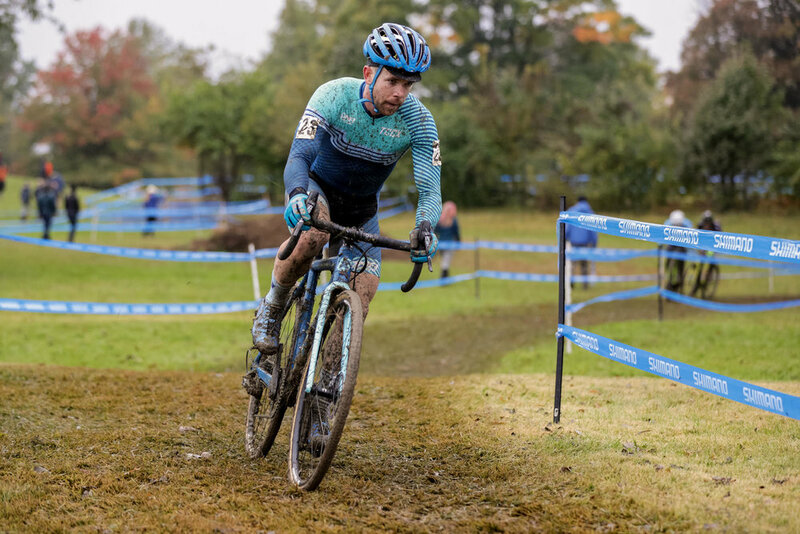 While I could have traveled farther East to HPCX in New Jersey, I wanted to test myself against the top guys in the country and see how my form was coming along. Case and point, I was the last person on the third row of the grid even with my current World Rank inside the Top 200. The field was stacked. Off the line, I got into my pedals and moved around a couple of riders to move closer to the front. I felt like I was in a good spot as we entered the course from the uphill start. Just as predicted, the first few corners were treacherous. Michael Van den Ham (Garneau-Easton) came sliding across the field and took out another rider, which I was barely able to avoid. I saw Anthony Clark (Squid Squad) picking himself up in the early going, along with numerous other riders slipping and sliding their way through the first part of the course. I stuck to my lines, feeling dialed and confident, as I managed to float through the trouble unscathed. By the end of the first lap, I was riding inside the top 20. In the moment, I had no idea of my position, but I could tell that I was on a good day, as they say. Feeling good, I was continuing to push on the pedals make up time where I could. As I entered “The Camel” section, I shifted to an easier gear, only to hear my derailleur start to move into the spokes. My reactions where quick enough that I could jump off my bike and fix the problem before I ripped my derailleur off. I backed my chain out from the spokes, shifted down a cog and ran the rest of the section, changing bikes as I made it to the pits. Lucky for me, I had Mr. David Palan and Scott Dedenbach, of Bike Shop CX fame, along with Dan Hoffman in the pits for Chris Aitken and me. I dropped my bike, told them what was wrong, and hopped on my B bike to catch back up. However, I was not so lucky to only have one set of mud tires, which were on my A bike. I exited the pit lane and as I pedaled the next couple of laps, I found myself lacking the grip I so desperately needed with only intermediate treads. I was losing spots like crazy, about eight to be exact, and I began towing the line between poise and frustration. But, I kept my cool and had to readjust my speed limit as I navigated the track. I was able to make it a lap and a half before jumping back onto my A bike to finish the race. Back on my preferred steed, I pedaled hard to make up the spots that I had lost. In my sights were Chris Aitken and Gunnar Holmgren (Hardwood Next Wave Cycling), who had left me behind most recently. I mashed on the pedals and floated the slippery sections, sticking to the lines that I knew best. I was able to make up some spots and passed both Chris and Gunnar. But the Good Karma chips I had cashed in during the opening laps ran out and I lost a spot, first to Gunnar, and then to Chris as I tried to ride the final section of “The Camel”. As I crossed the line, I was a bit disappointed in myself for not continuing to execute the same lines that I had all race on the final lap. But looking at the positive side of things, I was happy with my start and the lines I took for a majority of the race, and even more thankful to have a team in Mr. David Palan, Scott Dedenbach, and Dan Hoffman to keep me rolling in some nasty conditions! As I opened my eyes on Sunday, I thought as I was still dreaming as I saw bright rays of sunshine peaking through the curtains. The rainstorms of Friday and Saturday had been pushed away to their next locale and in their place were strong winds and sunshine skies. Watching the Superprestige in Ruddervoorde, I was feeling good (probably the pancakes) and looking forward to seeing the changes for day two. The course was much drier today as the wind and the sun cleared up many of the puddles on course. Aside from the nicer weather, the track had transformed to favor powerful riders. With fewer off-cambers and more flat pedaling, the race would be for the rider who could lay down the watts for the full 60 minutes of racing. The conditions and the track suited my skills (not necessarily my watts), and my confidence was growing as I rolled around during pre-ride inspection. We lined up on the grid and in our faces came a strong headwind. The start seemed to happen in slow motion. We were all sprinting at our maximum but with strong winds, no one was going anywhere really fast. Since the conditions were much drier today, the first turns were, again, chaos as racers bumped elbows and battled for the fastest line, stacking up three or four wide through the first section of the course. I was feeling good about my position in the field and doing what I could to sneak spots whenever and wherever I could. And just as we rounded one corner, Drew Dillman (SDG Muscle Monster) slid out and I had nowhere to go but over top of him. Everyone was physically okay (or at least I hope), but after untangling bikes, my bars were tweaked severely to the right. I dismounted my bike and straightened them as best as I could before carrying on. Now off the back, there was nowhere to go but forward! I got to the pit and dropped my bike off with Scotty D, Sam, & Craig and started my chase. I started leap frogging from group to group, trying to get back as many places as I could in the shortest amount of time possible. Remember how I said the course suited a rider that could lay down the watts? Yeah, that was still the case and I was not one of those riders today. 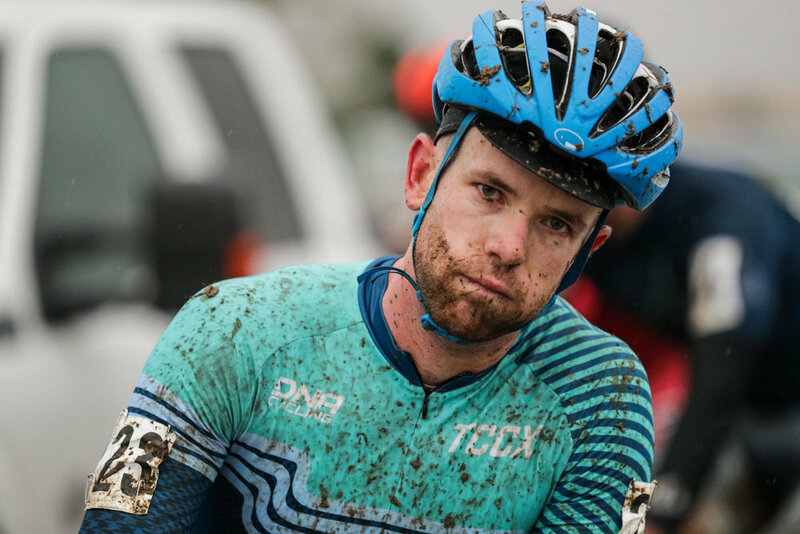 I was pedaling hard, gnawing on my stem any time I turned into the headwind, but after a few laps of chasing, the lights started to dim in my engine room and I came to the realization that the race was too far in front of me to catch back on. I still had enough in me to ride hard, but my efforts yielded little forward progress and I managed to cross the line on the lead lap in 38th place. Though the results may be disappointing, there are still a lot of positives to take away from the weekend. First, I’m thankful to have the support of my cyclocross family and to have such amazing folks help me out in the pits. Without the help of David, Scott, Dan, Sam, and Craig I would have been in some trouble for sure! Second, I was able to demonstrate to myself a bit of poise and willingness to persevere through different circumstances. 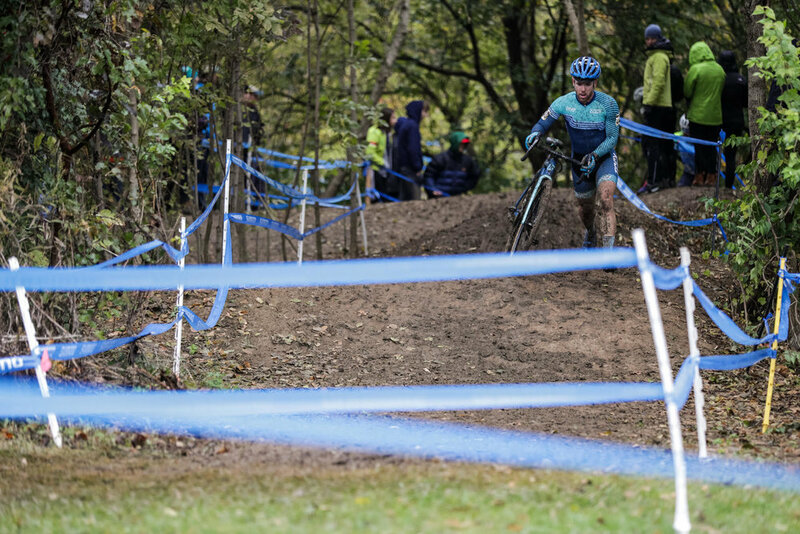 In cross you need a bit of luck to go along with the training and preparation that you put in. And when things don’t go your way, you need to have a bit of mental toughness to keep moving forward. Make it through the next turn, hit this particular line, make it one more lap. Anything to keep you in the game. Sometimes those little mind games don’t seem worth it in the moment, but hopefully they’ll pay off down the road. Next up, we’re heading upta Massachusetts for the Really Rad Festival of Cyclocross!